I recently read Plutarch’s Life of Nicias, Athenian general during the Peloponnesian War, and at the end of it come a few fascinating lines that show how knowing Greek literature, and knowing it by heart, may turn out to be a savior, so long as you happen to be at the mercy of others who also value it! A win for the humanities! Here is the passage (29.2-3), my translation adapted from Bernadotte Perrin’s (LCL, Plutarch, Lives, 3, pp. 308-309), with the Greek below. 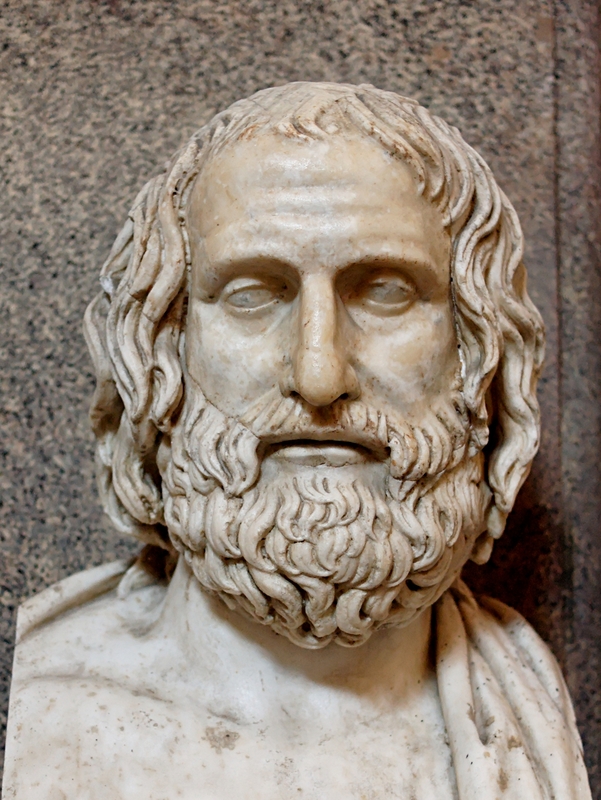 2 … Some [captives] were also saved for the sake of Euripides. For the Sicilians, it seems, more than any other Hellenes outside the home land, craved his poetry [mousa]: learning by heart the little samples and morsels that visitors brought them from time to time, they would happily share them with one another. 3 In the present case, at any rate, they say that many [Athenians] who reached home in safety kindly greeted Euripides and told him, some that they had been set free from slavery for thoroughly teaching what they remembered of his works, and some that when they were roaming about after the final battle they would get food and drink for singing some of his songs [melos]. It is not surprise, then, that they say [the Sicilians], when the Caunians’ ship was pursued by pirates and about to put in at the harbor [of Syracuse], at first did not allow them and kept them out, but when they asked if they knew any songs [asma] of Euripides, and [the Caunians] declared that they did, they allowed them entry and brought the ship in. 2 … ἔνιοι δὲ καὶ δι᾽ Εὐριπίδην ἐσώθησαν. μάλιστα γάρ, ὡς ἔοικε, τῶν ἐκτὸς Ἑλλήνων ἐπόθησαν αὐτοῦ τὴν μοῦσαν οἱ περὶ Σικελίαν: καὶ μικρὰ τῶν ἀφικνουμένων ἑκάστοτε δείγματα καὶ γεύματα κομιζόντων ἐκμανθάνοντες ἀγαπητῶς μετεδίδοσαν ἀλλήλοις. 3 τότε γοῦν φασι τῶν σωθέντων οἴκαδε συχνοὺς ἀσπάσασθαι τὸν Εὐριπίδην φιλοφρόνως, καὶ διηγεῖσθαι τοὺς μέν, ὅτι δουλεύοντες ἀφείθησαν ἐκδιδάξαντες ὅσα τῶν ἐκείνου ποιημάτων ἐμέμνηντο, τοὺς δ᾽, ὅτι πλανώμενοι μετὰ τὴν μάχην τροφῆς καὶ ὕδατος μετέλαβον τῶν μελῶν ᾁσαντες. οὐ δεῖ δὴ θαυμάζειν ὅτι τοὺς Καυνίους φασὶ πλοίου προσφερομένου τοῖς λιμέσιν ὑπὸ λῃστρίδων διωκομένου μὴ δέχεσθαι τὸ πρῶτον, ἀλλ᾽ ἀπείργειν, εἶτα μέντοι διαπυνθανομένους εἰ γινώσκουσιν ᾁσματα τῶν Εὐριπίδου, φησάντων ἐκείνων, οὕτω παρεῖναι καὶ καταγαγεῖν τὸ πλοῖον.